The bagua chart is used differently in Black Hat Sect feng shui than Traditional feng shui. Traditional feng shui relies upon the Classical principles of Compass and Shapes and Form School of feng shui while Black Hat sect practitioners place the bagua chart the same way for each home. 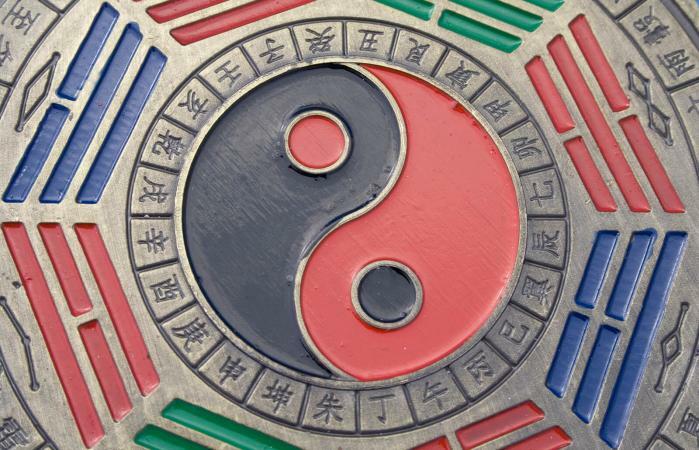 In Traditional or Classical feng shui, the placement of the bagua is governed by the compass readings. While Black Hat feng shui doesn't use many of the techniques found in Traditional or Classical feng shui schools, it uses general feng shui and Zen theories and philosophies. This includes the use of the bagua, although in Black Hat feng shui the east, center and west bagua sectors are assigned slightly different aspects of life. You can use this printable Black Hat Sect Bagua Chart with your home or office layout. 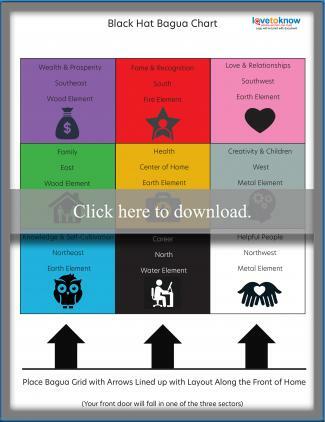 You will need to download the printable bagua chart. Click on the image of the printable. This will pull up a PDF file in a new window. You will need to open the image in Adobe Reader. You can use the LTK Guide for Adobe Printables should you run into any problems. There two ways you can use your downloadable Black Hat Sect bagua chart. One is a transparency, and the other is used with a graphite sheet. Both will be placed over the layout so the south grid is at the top of your home layout with the north grid falling over the front of your home. If the main entrance to your home isn't at the front of your home, place the grid accordingly to that door. It's best if the layout of your home is the same size as the bagua chart or as close as possible. You can use the transparency method for a fast and easy method to use your printable bagua chart. Select to print using color and print the bagua chart onto a transparency sheet. You will place the transparency (south at top) over the layout of your home or office for a complete picture of the sectors of your home according to Black Hat feng shui rules. The second method is to print the bagua chart on paper and use a graphite sheet to transfer the grid to the layout of your home or office. Tape the layout of your home or office to a flat surface. Line up and tape the graphite sheet to the layout. Follow this with the bagua chart and tape it in place too, so there is no slippage. Use a pencil (HB) and trace the outline of the bagua chart onto your house layout that is underneath the graphite sheet. You may wish to use a ruler or other straight edge for best results. Lift printable and remove tape. Remove graphite sheet and tape. Remove the tape from the layout and use the original printable as a reference for each sector on the bagua chart. The bagua is an octagon shape that is divided like a pie chart. Each slice is known as a trigram and contains specific information that relates to each sector of your home. The Trigrams are divided into the four main directions of North, South, East, and West. The other four trigrams are Northeast, Northwest, Southeast, and Southwest. The Black Hat Sect uses the traditional feng shui nine grid square for an easier overlay instead of the octagon bagua. In this school of feng shui, you simply overlay the blueprint of your home with a bagua chart. This will provide you a clear picture of each sector of your home according to the grid. The bagua uses the same placement regardless of the home. The front door is always the anchor for the bagua, which is the North side of the bagua (feng shui mandates that South is always at the top). Don't let the compass directions confuse you. These aren't compass readings for your home but are compass directions strictly used in the makeup of the bagua. If you want to take a step further with the Black hat bagua chart, you can reduce the bagua chart to fit in each room. You'll position the bagua according to the door entrance to the room, treating it as a front door for placing the bagua over the room layout. The bagua chart will reveal the eight life situation areas in your home, plus the center. You can also apply grid this to an office or business. In Black Hat sect feng shui, there are nine basic feng shui cures available for you to use in conjunction with your bagua chart in order to correct or diminish negative feng shui elements. Bamboo Flutes: You can use a pair of bamboo flutes to remedy inauspicious aspects, such as poison arrows and overhead beams. Color: In Classical feng shui color cannot activate an element and therefore isn't considered a cure, but Black Hat often uses color in place of an element as a means of activating the element. Earth objects: Pottery, stones, rocks, and statues made of marble and other stone can activate earth elements. Electrical equipment: Technological equipment, computers, televisions and any home appliance or equipment that operates on electrical current generate yang energy. Lighting: Objects that refract light are auspicious and includes mirrors, crystals, crystal balls, and artificial lighting. Living plants and animals: Plants (especially lucky bamboo), flowers and fish. Animals generate yang energy that enlivens homes. Sounds: Wind chimes and bells can be used as enhancers or cures. Wind or water moving objects: Water fountains, mobiles, windmills, pinwheels, whirligigs, and water chimes. Various other cures such as replicas of animals, frogs, elephants, fish, coins, and other cures can be used. A bagua chart is known as a map that you can use to determine what areas of your home need adjustments to correct the flow of chi, unblock stagnant chi, cure or remedy chi and to ensure the health and well-being of all who reside in your home. Once you get the general bagua layout of your home, you can also use the bagua chart in each room to determine where each life situation is located and if any feng shui remedies are needed.